About 8 minutes into the video, scores of NKTites sent by Kelsang Gyatso and subsidized by taxpayers are seen protesting against the Dalai Lama in unison with China's demonstrators. The first 8 minutes present China's policy against historical Tibet's independence from China which was terminated by Mao Zedung's communist overthrow of Tibet during the 1950s. 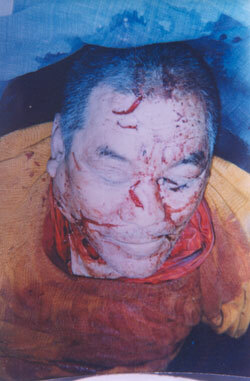 Mao Zedung told the Dalai Lama that "religion is poison." Kelsang Gyatso views Tibetan Buddhism as poison, degenerate and corrupt, and thus protests against Tibet's Government in Exile, which escaped to India in 1959. China and NKT chant, "Dalai Lama, stop lying." Neither China nor NKT can accept Tibetans' view that the Dalai Lama is their spiritual and temporal leader. Tibet's succession of Dalai Lamas has held this esteem by Tibetans since the 1600s. NKT calls the Dalai Lama a liar, nazi and puppet of the CIA. NKT even claims that the Dalai Lama is not a Buddhist. Also falsely, NKT claims that Shugdenism is a core Buddhist tradition, when in fact Shugdenism is a cult now mostly outside Tibet due to the politics of Kelsang Gyatso selling NKT as "the pure lineage." NKT and China intend to indoctrinate all of us - against Tibet and genuine Buddhism and away from compassion and true spirituality while they amass great wealth. 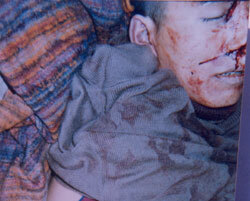 A recent editorial headline on a NKT support web site claims, "Dalai Lama messes with Tibetans' minds." After watching the video, ask...who is messing with whose minds? Who is poisoning Buddhism? The Dalai Lama, one of the most revered persons living today as NKT asserts? "Born into a farming family in the simple village of Taktser, Tibet, in 1935, His Holiness was recognized as a two-year-old reincarnate Dalai Lama. In the following years, he enjoyed an extraordinary childhood, studying subjects far removed from an ordinary child's education, including philosophy, astrology, metaphysics, dialectics, and much more. In his teenage years, His Holiness simultaneously engaged in a rigorous course of study for his Geshe (Doctor of Metaphysics) degree and assumed full responsibility for his people's welfare as the leader of Tibetans. At the early age of fifteen, while immersed in rigorous study of religion and metaphysics, His Holiness was compelled by political circumstances to assume responsibility for Tibet's temporal and spiritual welfare. Thus began this Dalai Lama's lifelong pattern of accomplishing, at once, extremely difficult achievements in multiple arenas requiring unusual flexibility, far-sightedness, and extraordinary dedication. After being exiled from his homeland in 1959 by the invasion of Chinese forces, His Holiness' level of accomplishments exponentially increased, as he entered a new and larger arena of interaction with the world. In the decades following this forced relocation from Tibet to India, His Holiness' compassionate activities expanded to include not only the challenges facing Tibetans, both refugees as well as those remaining behind in his homeland, but also the issues most deeply affecting all citizens of the globe. He continued to immerse himself in the widest array of subjects, including quantum physics and Western psychology. In a highly unusual and creative step, His Holiness initiated mutually respectful dialogues between religious leaders and scientists which ultimately led to the creation of the Mind and Life Institute, promoting cross-cultural scientific research and understanding. Three major commitments stand out among His Holiness' activities. The promotion of human values encompassing compassion, forgiveness, tolerance, contentment and self-discipline. His Holiness refers to these human values as secular ethics. As a religious practitioner, His Holiness' second commitment is the promotion of religious harmony and understanding among the world's major religious traditions. As the spiritual and temporal leader of Tibet, his third commitment is to safeguarding the welfare, on all levels, of the Tibetan people. Among the achievements His Holiness has found most meaningful to him is his tireless promotion of interfaith understanding, His Holiness has continually created and maintained contacts within diverse religious communities, including the Jain, Christian, Jewish, Sikh, Hindu and Muslim faiths as well as with secularists. As he commented at a meeting of the International Association for Religious Freedom, "A society, which has many religions should also have many prophets and sources of refuge. In such a society it is very important to have harmony and respect amongst the different religions and their practitioners. We must distinguish between belief and respect. Belief refers to total faith, which you must have in your own religion. At the same time you should have respect for all other religions." All of this His Holiness has accomplished against a backdrop of more than a half century's constant efforts in search of support for Tibetans. He is continually requested and agrees to give teachings around the world at all levels, as well as secular public talks. He grants countless newspaper and television interviews, and has written or co-authored a dazzling number and diverse array of books addressing many subjects. His Holiness has been equally active in his exile home in India. Almost from the moment he arrived as a refugee in 1959, he has bent every effort toward preserving Tibet's heritage through preserving its spiritual heritage and encouraging educational excellence and governmental reform. In exile, His Holiness the Dalai Lama had the vision to lay the foundation for modern Tibetan democracy. Under his guidance and foresight, today, the exiled Tibetan government and the Tibetan refugee communities spread across India has evolved into a vibrant and representative electorate operating under a democratic charter. In Tibet, under the harsh policy of the Chinese government, Tibetan religion and cultural identities are threatened; among Tibetans living in exile, under the leadership of His Holiness, Tibetan religion, languages and culture thrives in the hundreds of monastic, cultural and educational institutions. His Holiness constantly stresses the importance of education for all, especially recognizing its essential importance as the foundation of well-functioning democratic societies. Woven through all these activities has been His Holiness's unwavering commitment to world peace. His compassionate stance forms part of a far-sighted plan offering a vision of how our world can commit, in order to save itself. "The fact of human interdependence is so explicit now," he has said "[that] the only peace it is meaningful to speak of is world peace. Destruction of your neighbor is essentially destruction of yourself. Our future depends on global well-being." His Holiness's championship of non-violence has earned him international respect, along with the Nobel Peace Prize, the Congressional Gold Medal, and scores of honorary doctorates, among other tributes." Kelsang Gyatso founded NKT in England about 1990 and thrives on generous taxpayer subsidies; his formula - mask his vitriolic campaign with sweets such as young clergy, easy-reading books, promises of fast-track enlightenment, arty franchises and pretense of being Buddhist. "I think it's a sign of these spiritually degenerate times that people are unable to tell the difference between a genuine spiritual Teacher and an imposter. I do hope that this world gradually awakens to the truth about the Dalai Lama institution because, at present, the Dalai Lama is fooling most people (Time magazine described him as 'the most influential person in the world'!) and as a result, he is able to get away with massive abuses of power, all of which is causing immense damage to Buddhism and great suffering to many." This assessment is far more appropriately applied to Kelsang Gyatso than to the 600-year history of the Dalai Lamas, particularly the current Dalai Lama who is respected by hundreds of millions of Buddhists around the world, hundreds of Buddhist monasteries and organizations, the Nobel prize organization, thousands of academic researchers, thousands of book stores around the world, hundreds of newspapers and book publishers, over a billion non-Buddhists, and at least a hundred heads of state. Relatively few consider Kelsang Gyatso a genuine spiritual teacher and most of these individuals learn they were wrong and leave NKT. "in 1991, a senior monk named Kelsang Gyatso established a new Dorje Shugden order based in England and called the New Kadampa Tradition (NKT). The NKT soon flourished by promising spiritual rewards for cash - an unholy sales pitch that helped trigger confrontation with the Dalai Lama's circle. ...the followers of the NKT have painted a hostile portrait of the Dalai Lama that is unrecognizable to mainstream Buddhists - indeed, to millions around the world who revere the Nobel Peace Prize winner and champion of Tibet. Shugden followers always believed their god could grant earthly favors, and NKT has richly exploited this belief. Though barely known in the East, the NKT has slickly and successfully promoted Dorje Shugden in Europe. It's the fastest growing Buddhist sect in Britain. It has also been denounced by the London press and the Dalai Lama as a cult that fleeces its own followers. "Nobody would pray to Buddha for better business, but they go to Shugden for such favors - and this is where it has become like spirit worship," the Dalai Lama told NEWSWEEK. "This is a great pity - a tragedy." 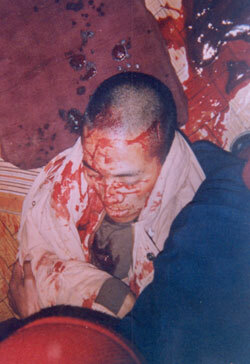 The occasion for the Newsweek article was the February 1997 brutal murders of 3 monks close to the Dalai Lama. Newsweek's article also covered the lead role of NKT's animated campaign against the Dalai Lama. "Each victim had been stabbed 15 to 20 times, leaving the walls of the small monk's chamber splattered with blood. Indian police believe the murders were committed by an obscure Buddhist sect that takes its name and inspiration from a minor but ferocious Tibetan deity: the Dorje Shugden. The Shugdens consider themselves guardians of Tibetan Buddhism, and particularly their branch of the faith, known as Gelugs..."
NKT cannot see that "Destruction of your neighbor is essentially destruction of yourself." Kelsang Gyatso abhors religious harmony. Kelsang Gyatso prefers obsession with Shugden, who most consider to be a demon. Fortunately, fewer than one tenthousandth of one percent of the world's inhabitants worship the Shugden created by Kelsang Gyatso.